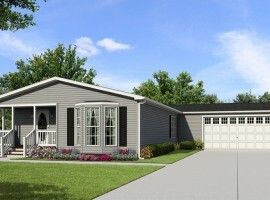 Cole Show Model | Rock Oak of Clarence - 55+ living that just makes sense. Rock Oak is pleased to introduce The Cole, a new floor plan designed to provide a three bedroom floor plan with open spaces for entertaining and a sumptuous master suite. 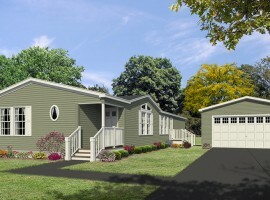 To showcase some of the design options Rock Oak offers, the Cole show model has been outfitted with an upgraded, 23′ x 24′ 2-car attached garage. 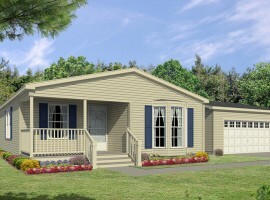 The home as shown offers three bedrooms, two baths, two covered porches and 1,523 sq. ft. of living area. As you enter the Cole off a charming front porch that spans the front of the home, you’re greeted by a handsome living room with a gas fireplace that opens off into a dining area and spacious kitchen with a breakfast bar with pendant lighting. The kitchen is equipped with Whirlpool appliances, including a 22 c.f. refrigerator, dishwasher, gas range and microwave. Light comes from recessed lighting and a large skylight. The extensive cabinetry, shown in a classic white, is nicely offset by contrasting countertops and ceramic tile backsplash in a deep grey. While the living areas of the Cole are open and inviting for entertaining, the private spaces of the Cole nestle their owners with comforts. The Master Bedroom suite includes a 13’7” x 12’6” Master Bedroom, a 9’6” x 12’6” retreat its own 10’ x 13’ covered porch with outdoor ceiling fan, and a beautiful master bath featuring a deep glamour tub, separate 36”shower and vanity with twin sinks.